December 6, 2016: A Georgia Tech delegation led by Provost Rafael Bras visited Tianjin University (TJU) to push forward collaborations between the two universities. GT visitors were impressed with what they saw at the TJU History Museum that showcased the university’s history and accomplishments since its founding in 1895, just 10 years after the establishment of Georgia Tech. The origin and the philosophy of the two universities, the distribution of majors, the focus on science and engineering and the emphasis on industrial collaboration all bear remarkable similarities. 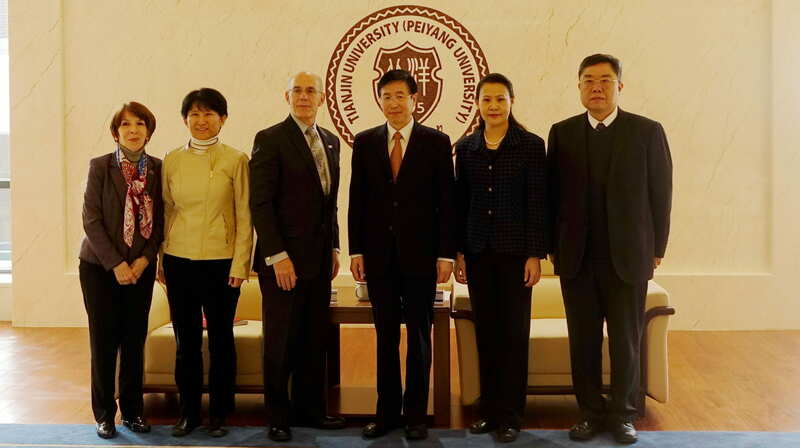 TJU Chairman of the University Council Dr. Jiajun Li and TJU President Dr. Denghua Zhong met with the GT delegation accompanied by other TJU leaders and faculty representatives. December 2, 2016: A new educational collaboration among Georgia Tech, the city of Shenzhen and Tianjin University in China will expand global opportunities in science, technology and engineering education. Georgia Tech’s President G. P. “Bud” Peterson signed an agreement in a ceremony in Shenzhen on Dec. 2. The Georgia Tech Tianjin University Shenzhen Institute will offer majors in electrical and computer engineering, computer science, industrial design, environmental engineering and analytics. Georgia Tech will coordinate the graduate programs at the specialized institute, and Tianjin University, China’s oldest university, will coordinate the undergraduate programs. More information. October 18, 2016: Some GT students had the luck of meeting Dr. Wayne Clough, the 10th President of Georgia Tech (1994-2008) and the 12th Secretary of the Smithsonian Institution (2008-2014) who was in Shenzhen attending the ICSI conference. October 17-19, 2016: Georgia Tech is a key organizer of the 2016 International Conference on Sustainable Infrastructure (ICSI), to take place during October 17-19, 2016 in Shenzhen. This conference isco-sponsored by the US Academy of Engineering and the Chinese Academy of Engineering. Designing and delivering infrastructure systems that truly contribute to sustainability throughout their service life is the theme of this conference. Plenary speakers include Dr. Wayne Clough, President Emeritus of Georgia Tech and Dr. John Crittenden, Direcotr of Brook Byers Institute for Sustainable Systems at Georgia Tech. Both Dr. Clough and Dr. Crittenden are members of the US Academy of Engineering. July 25, 2016: A Georgia Tech delegation led by Provost Rafael Bras met with Vice Mayor Yihuan Wu of Shenzhen today, along with leaders of several departments of the Shenzhen municipality and a large Tianjin University delegation. The three parties discussed many details of the proposed Specialized Institute. Georgia Tech is interested in offering academic programs in Electrical and Computer Engineering, Computer Science, Industrial Design, Environmental Engineering, and Analytics. Read Provost Bras’ blog about the visit. January 18, 2016: A Memorandum of Understanding was signed today by Mayor Qin Xu of Shenzhen, President Bud Peterson of Georgia Tech (GT) and President Jiajun Li of Tianjin University (TJU). The three parties agree in principle to work towards establishing a Specialized Institute in Shenzhen where a new GT-TJU campus will be constructed and paid for by the Shenzhen government and students will be able to earn a TJU undergraduate or graduate degree or a GT graduate degree at the Shenzhen campus. Multiple academic disciplines will be involved. The details are to be worked out in the coming months. 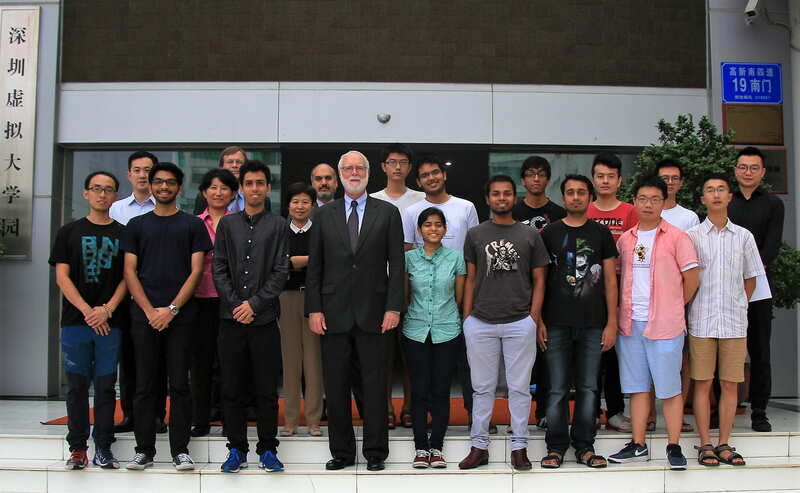 August 20, 2015: A Georgia Tech delegation led by Provost Rafael Bras visited Shenzhen today. Meetings were held with leaders from the Shenzhen Science, Technology and Innovation Commission and Shenzhen Education Bureau to discuss the future developments of Georgia Tech in Shenzhen. Read Provost Bras’ blog about the visit. June 26, 2015: 47 Georgia Tech China Summer Program (CSP) participants arrived in Shenzhen today to begin 3 weeks of studies at the Shenzhen Virtual University Park. CSP was inaugurated in 2005. The 9-week program now spends 3 weeks in Tianjin, 3 weeks in Shanghai, and 3 weeks in Shenzhen. Students are immersed in Chinese language and culture while making progress towards their degrees. Students from other US universities can participate in the CSP as well. January 20, 2015: Georgia Tech – Shenzhen welcomes visitors from The Southern Association of Colleges and Schools Commission on Colleges, the regional body for the accreditation of degree-granting higher education institutions in the Southern United States. Georgia Tech – Shenzhen is an approved instructional site of Georgia Tech. November 15, 2014: The Shenzhen Virtual University Park celebrated its 15th anniversary today with a tree planting ceremony. Georgia Tech Vice President Stephen Fleming and Georgia Tech – Shenzhen Director G. Tong Zhou planted a tree on behalf of Georgia Tech. October 17, 2014: Vice Mayor Ms. Yihuan Wu visited Georgia Tech Shenzhen students and faculty accompanied by Mr. Guoqiang Huang, Deputy Secretary General of the People’s Government of Shenzhen Municipality, Ms. Xuan Qiu, Deputy Director-General of the Science, Technology and Innovation Commission, Mr. Kun Fan, Deputy Director of the Shenzhen Municipal Education Bureau, Mr. Jianling Xu, Higher Education Division Director of the Shenzhen Municipal Education Bureau, and other leaders of the Shenzhen government. August 22, 2014: We have successfully wrapped up the first week of classes at GT-Shenzhen, and embarked on a Shenzhen Overview Tour today. Everyone loved the beautiful city of Shenzhen with its blue waters, lush greenery, clean air, its cityscape, and the vibrant energy that made it a miracle city that it is today. August 18, 2014: This is the opening day of the Georgia Tech – Shenzhen MS ECE program! Our first class of students hailed from top universities in mainland China, USA, Indonesia, and Taiwan. Three Georgia Tech professors are teaching on-site during the fall 2014 semester in Shenzhen. Video classes from GT-Atlanta add to the course options. We thank Tianjin University for their support in helping us launch this important new program in Shenzhen! April 23, 2014: A Georgia Tech – Shenzhen media briefing was held at the Shenzhen Virtual University Park to formally announce the Georgia Tech – Shenzhen Master of Science program in Electrical and Computer Engineering (ECE). General Jennifer Galt of the US Consulate General in Guangzhou delivered the opening remarks. She emphasized that an investment in cooperative education programs between the U.S. and China is an investment that pays dividends for all of us. These programs bridge language barriers, open lines of communication, and connect people in both immediate and lasting ways. Mr. Guohui Gao, Deputy Secretary-General of the Shenzhen Municipal Government commented that the opening of the Georgia Tech program in Shenzhen is a fruitful outcome of the friend-city agreement between Shenzhen and Atlanta that was entered into a couple of years earlier. Shenzhen is a high tech city but lacks higher education resources thus Georgia Tech’s presence is highly appreciated by the government of Shenzhen. President Bud Peterson and Vice Provost Yves Berthelot of Georgia Tech provided details of the new Georgia Tech Shenzhen program. Mr. Harley Seyedin, President of the American Chamber of Commerce in South China, gave an enthusiastic speech emphasizing the importance of “peace through education and commerce” and conveyed his strong belief that Georgia Tech – Shenzhen graduates will be highly sought after by multinational companies. In attendance were also the following Shenzhen Municipal government leaders: Dr. Jian Lu, Director-General, Shenzhen Science, Technology and Innovation Commission; Ms. Yurong Guo, Director, Shenzhen Municipal Education Bureau; Ms. Xuan Qiu, Deputy Director-General, Shenzhen Science, Technology and Innovation Commission; Mr. Jianling Xu, Director, Higher Education Division of Shenzhen Municipal Education Bureau; Zhijun Huang, Director, Shenzhen Internationalization Promotion Committee. Additional Georgia Tech delegation members, representatives from Georgia Tech’s industry partners as well as a number of Georgia Tech alumni also attended the event. Please visit the media briefing page for details of this event along with videos and transcripts of the speeches. 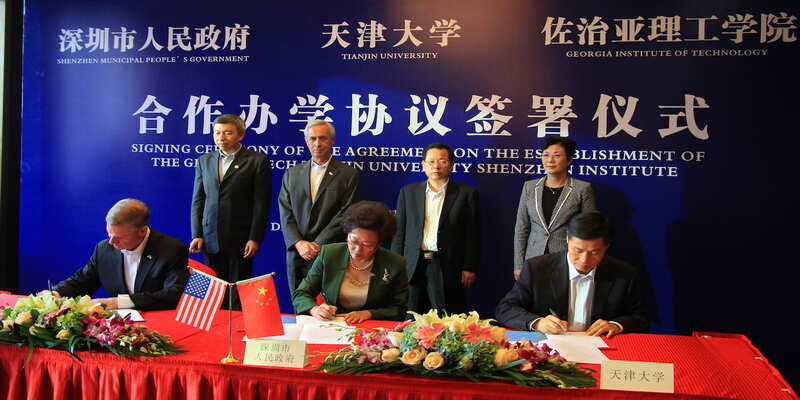 April 1, 2014: Georgia Tech – Shenzhen became a member of the American Chamber of Commerce in South China. November 1, 2013: Georgia Tech – Shenzhen campus has been added as an option in the Georgia Tech Graduate Admissions system. We are now accepting applications to the GT MS ECE program in Shenzhen for Fall’2014 enrollment! Application to GT-Shenzhen is identical to the application to GT-Atlanta, but you must select the GT-Shenzhen campus in order for your application to be considered for the Shenzhen program. All applicants must also mail their official sealed transcripts to the GT-Shenzhen office in Atlanta; see Contact US page. The online application deadline is May 1, 2014 for Fall’2014 enrollment. Please visit the application requirement page for detailed instructions. Admission decisions are made in the GT headquarter in Atlanta. We do not use intermediaries or 3rd parties in our recruitment or admission processes but we do love our former and current GT-Shanghai MS ECE program students who are enthusiastic supporters for Georgia Tech’s growth in China! Follow the Georgia Tech – China initiatives via videos here. August 29, 2013: The Chinese Ministry of Education has approved for Georgia Tech to offer its existing Masters of Science (MS) degree in Electrical and Computer Engineering (ECE) in Shenzhen, China, to begin in 2014. The program permit number is MOE44US1A20131462N. This degree program will be in partnership with Tianjin University. Each year, up to 120 students will be admitted to pursue the Georgia Tech MS ECE degree in Shenzhen, including up to 20 students who will receive both the Georgia Tech MS ECE degree and a Tianjin University Masters degree in a related discipline. The rest up to 100 students will only recieve the Georgia Tech MS ECE degree. Georgia Tech will be responsible for MS ECE student admission, course instruction, and degree granting, while Tianjin University will provide administrative, logistical, staff and student support. Classes will take place in the Shenzhen Virtual University Park, located inside the Shenzhen High Tech Industry Park. It takes students 3 semesters to complete the GT MS ECE degree requirements. Students are encouraged to engage in internships in between academic semesters, and/or choose to spend the last semester of study in the Georgia Tech main campus in Atlanta or in its Lorraine campus in France. April 12, 2013: A Georgia Tech delegation led by President G. P. “Bud” Peterson visited Shenzhen today and was warmly welcomed by the Honorable Mayor Qin Xu of Shenzhen. Also on this day, Georgia Tech became the 55th member of the Shenzhen Virtual University Park (SZVUP), the first university from the United States to join the SZVUP. Subject to proper approvals, Georgia Tech plans to offer its Masters degree programs in Shenzhen, beginning with Electrical and Computer Engineering. Research, technology transfer and business incubation activities will also be pursued along with graduate education.